The stampede of gold miners up to Alaska started with a gold discovery in the Klondike region of remote northwestern Canada in August of 1896. Due to the extremely remote location, very few people heard about the gold strike until the following summer in 1897, when word reached the larger cities of Seattle and San Francisco. Excitement of vast riches motivated thousands of men to uproot their lives and head north to make their fortune. Alongside the miners and prospectors were businessmen, eager to sell goods to the men who ventured north. Miners had several possible routes that they could take to the Klondike, each with its own set of obstacles. The remoteness of the region made travel extremely difficult as well as expensive. Some prospectors chose to take riverboats from the Bering Sea up the Yukon River. While this seemed like a simple proposition, this was actually a very poor choice, as the icy conditions on the river made it very difficult for boats to get far enough up the Yukon River to access the gold bearing region of the Klondike. Very few of the miners who attempted to reach the Klondike by boat were successful. The limitations of boat access required most of the prospectors to take overland routes to get to the gold. The overland routes that most of the prospectors took were from the ports at Skagway and Dyea in southeast Alaska, where they would then take trails across the border into Canada. The single most difficult part of this journey was the requirement by the Canadian government for each man to carry enough food and supplies to survive for a year. This meant that each miner needed to take multiple trips, sometimes as many as 30, back and forth to bring all of their food and supplies with them. With limited horses and stock available, most of these supplies were carried on their backs, or pulled behind them on sleds. Any stock animals that were available were extremely expensive, and native Alaskans were known to charge the traveling miners one dollar per pound to haul gear. There were two main options for overland travel; Whites Pass and Chilkoot Pass. Whites Pass was very rough and treacherous, and horses were often killed making the journey over the pass. One point along the trail is named “Dead Horse Pass”, because of all the dead animals that were left there. The huge numbers of men that traveled over the pass eventually made it impassable. Chilkoot Pass was another option for the miners, but the steep descent on the back side of the mountains was impassible to stock animals, so the men were forced to carry all their gear on their backs. Nearly all the miners who ventured into the wilderness used one of these passes to reach the Klondike. Although there were a few other routes across Canada’s mainland, they were so isolated and treacherous that almost no one successfully made it to the Klondike using those routes. The miners who successfully crossed over the passes with all their supplies would then camp at Lake Bennett or Lake Lindeman near the Yukon River. They used timber to build makeshift boats, which were used to float down the river to the Klondike. Many men died on this part of the journey, as poorly made boats were no match for the rapids of the Yukon River. It is estimated that over 100,000 men ventured north to Alaska, but only 30,000 to 40,000 ever successfully made it to the Klondike. Of those, only about 4,000 ever struck gold. Most of the best land was claimed up before the masses ever arrived, so the men that did make it still needed to search for profitable areas to mine. Most settled for working lower valued claims, or returned back home with nothing to show for their effort. Only a small group of men actually got rich from gold mining in the Klondike, probably only a few hundred. After only a few mining seasons, news spread about new gold discoveries in Nome, Alaska, and in Atlin, British Columbia. Most of the miners that were still working their claims in the Klondike headed off to get rich at one of these new gold strikes. While very few men got rich in the Klondike, it did bring thousands of people up north to begin the exploration of the Alaskan wilderness. 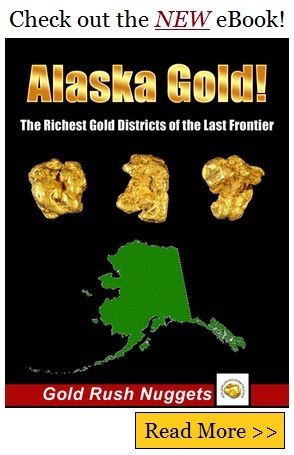 Many more Alaskan gold discoveries followed in the years to come.